Bin trolleys | Stainless steel | ITB Engineering & Production s.r.o. This type of trolleys is for transporting and storing used dishes in the basket. They are manufactured from high quality stainless steel. Their construction is welded or foldable and has high strength and load-bearing capacity. The trolleys are supplied with wheels with a diameter of 100mm or 125 mm with or without brakes, and thanks to the single-screw connection, the wheels easily replaceable. 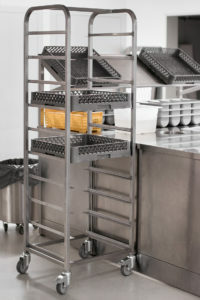 The customer has the option of choosing a version without a barrier or with a barrier preventing the gastronorm containers from falling out during transport. In addition, there is a choice of various numbers of insertions. We produce “H” and “Z” type trolleys (the advantage of stacking empty trolleys). The trolleys are suitable for 500 mm x 500 mm bins.